October is a busy month for disability advocacy and observances. From White Cane Safety Day (Oct. 15) and Disability History and Awareness Weeks (October 2-13) to Disability Employment Awareness Month and everything in between – I am thrilled the Division of Blind Services is doing its part as a powerful voice in our communities. We kicked off the month with the launch of our See Different PSA. The goal for the video is to have everyone to see individuals with visual disabilities – like everyone else – and recognize the benefits of the full inclusion for this segment of our society. By seeing this value, people will be motivated to act upon their changed perceptions. Our staff had a great time meeting with clients across the state while filming and listening to their stories. In the coming weeks, we will be sharing their breakout videos on our social media pages. There, you will have the opportunity to get to know Stephanie, Virginia, Surya, Tempest, Sammy, Rachel, Doug and Laura. In honor of White Cane Safety Day, our See Different team is also preparing to speak to local drivers’ education classes in an effort to inform Florida’s newest drivers about the White Cane Law. White Cane Safety Day also allows us to celebrate the accomplishments of individuals with visual disabilities in our state who have overcome unique challenges to achieve success in life. Their perseverance is a testament that success is not predetermined by our demographics (like what you are or where you come from), but based on who you are and the talents that you contribute to the equation! Though blind and visually impaired individuals may see the world differently than others, they share the same qualities to create and build a better world around them. Our mission is to ensure they have the tools, support and opportunity to fulfil their goals. During the Florida Cabinet Meeting, Governor Rick Scott presented teachers of students with visual impairments (TVIs) with Governor’s Shine Awards. The Shine Award is presented to Florida educators who have impacted the lives of students through the classroom. Our district TVIs travel to the students’ local schools to provide instruction - typically in supplement to a traditional classroom setting. The pathway toward achieving a good career starts with a quality education, and we are so thankful for our teachers. 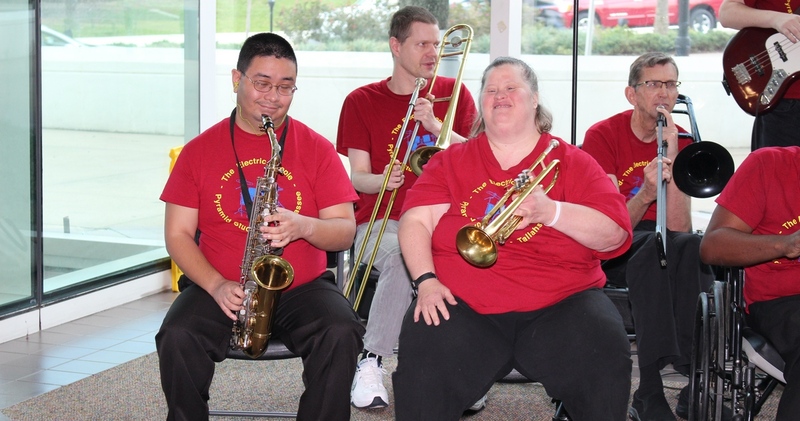 As we continue to celebrate all of the wonderful activities this month, let’s continue to encourage others to take advantage of the resources that educate and strengthen the connections between them and persons with disabilities. October is Blindness Awareness Month. Approximately 180 million people worldwide suffer from blindness or some form of visually impairment. The Florida Division of Blind Services is honoring this observance with the release of its See Different public service announcement (PSA). The See Different initiative showcases how individuals with visual disabilities, like their sighted peers, possess qualities and capabilities to contribute to and succeed in the classroom, workforce and their communities. This past year, DBS has hosted several interactive presentations at K-12 schools, universities and businesses. During these sessions, the See Different team demonstrated how people with visual impairments participate in daily living activities. The activities within these forums included personal testimonials, success stories and simulated experiences (i.e., activities with a blindfold or vision simulator). The DBS Communications team has created the following PSA in an effort to effectively change perceptions on a wide scale and communicate values in a message that will move citizens to think and act differently. The video was created in an effort to effectively change perceptions on a wide scale and communicate values in a message that will move individuals to think and act differently. The individuals featured in the video are all current or former DBS clients. In addition to the PSA, DBS is releasing weekly breakout videos with each client sharing his or her story. Thank you to everyone who participated and we hope you enjoy the videos. The Division of Blind Services Florida Rehabilitation Council Quarterly Meeting and Public Forum is scheduled for October 26-27 at the Terrace Hotel at 329 E. Main Street in Lakeland. October 26 8:30 a.m. to 4 p.m.
October 26, 5:00 to 6:00 p.m. – Public Forum to which all persons are invited. October 27 from 9 a.m. to 10:30 a.m. The Florida Division of Blind Services helps individuals with visual impairments achieve employment and independence under Title 1 of the Rehabilitation Act. For more information, contact Selena.Sickler@dbs.fldoe.org. Ten businesses that hire people with disabilities were recognized by the state of Florida today for being exceptional employers of people with special abilities. The businesses from around the state were honored with a plaque made by individuals with unique abilities. The 12th annual celebration was held at Tallahassee City Hall as part of recognizing October as Disability Employment Awareness Month. The Agency for Persons with Disabilities (APD), Blind Services, and Vocational Rehabilitation presented the Exceptional Employer Awards to companies that have made a strong commitment to employing people with special abilities. Event sponsors were the Able Trust, City of Tallahassee, and RESPECT of Florida. Speakers at the Exceptional Employer event included Tallahassee Kentucky Fried Chicken Restaurant employee Klaressa Williams and AMC Theatres employee Walker Bullington. Others providing remarks were Department of Economic Opportunity Chief of Staff Cissy Proctor, Tallahassee Commissioner Curtis Richardson, Director of ABLE United John Finch, and President and CEO of the Florida Association of Rehabilitation Facilities Suzanne Sewell. 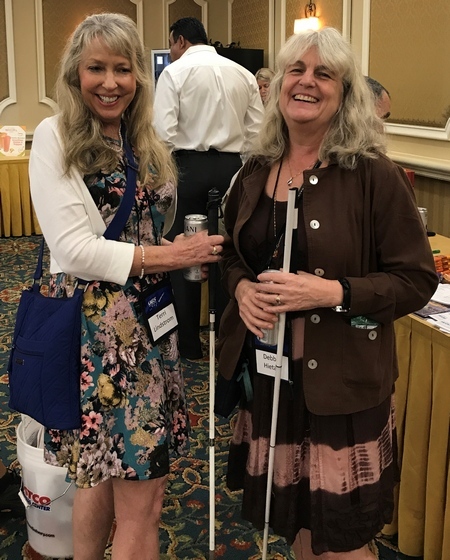 The Blind Vendors of Florida along with DBS Bureau of Business Enterprise (BBE) staff recently participated in the 2017 Biennial Seminar in Orlando. The seminar was attended by nearly 150 people, including vendors, trainees, BBE staff, a host of trade show participants and others. Activities kicked off with a trade show that featured booth displays of snack samples, vending machines and adaptive technology. 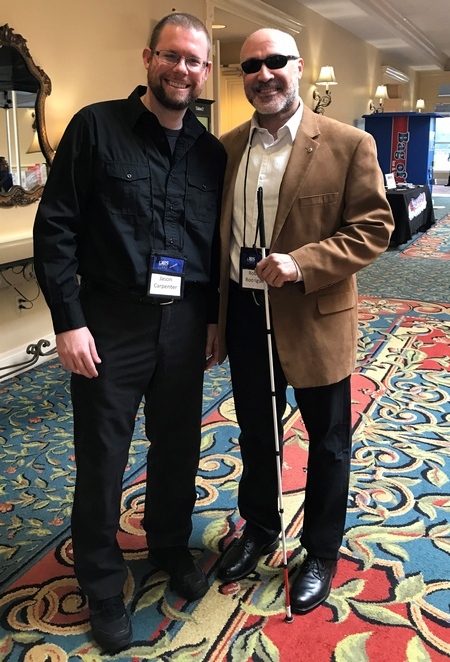 The keynote speaker for Day One was Nicky Gacos, President of the National Association of Blind Merchants. He also serves on the Board of Directors for the National Automatic Merchandising Association and is chairman of the Committee of Vendors in his home state of New Jersey. Gacos spoke about the state of the Business Enterprise program on a national scale and the issues and challenges that face blind vendors throughout the country. Seminar participants attended their choice of breakout sessions on a variety of subjects selected to help them in their businesses. Retirement planning, healthy vending, telephone etiquette, technology and highlights from the Disney Business Institute training were some of the topics covered. Other sessions were presented by guest speakers from CareerSource, the Division of Blind Services and the Red Cross. Day Two opened with guest speaker Thomas Self, Central Florida Regional Director for U.S. Senator Marco Rubio, R-Florida. Self read a letter on behalf of the senator and answered questions from the audience on legislation that affects blind vendors throughout the country. Bureau Chief Bill Findley also and provided an update on the current state of BBE. The seminar ended with the election of Jim Warth as chairman and Alton Palmore as vice chairman of the Committee of Vendors. Jim Parkman was one of 30 vendors who received award for their years of service. Parkman has completed 50 years with the BBE program. Vendors Darryl Brinton and Mike Renaud received special recognition for outstanding service to the program, and Nancy Spiliotis was recognized for her contribution to the program for the many years she supported her late husband and former State Committee Chairman, Tom Spiliotis. BBE Operations Manager Maureen Fink received a plaque commemorating her 20 years with the program. The Biennial Seminar is not just an educational opportunity. It is also a chance for vendors to connect and to have a little fun. BBE staff performed a skit titled “The Technical Support Hotline,” which depicted the challenges of getting technical assistance on the phone. The “Spirit of Spiliotis” band, consisting of Don Gerschick, Jim Anderson and John Kalivoda, also performed. 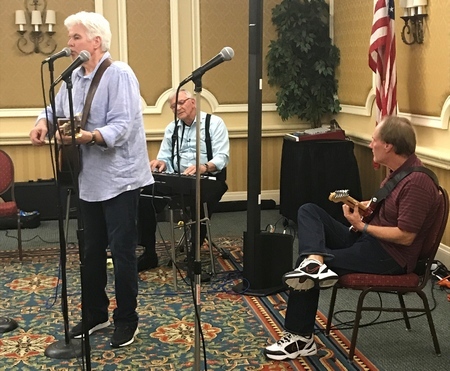 Operator Mary Ann Grignon serenaded the audience with her rendition of the Tennessee Waltz and the Tallahassee Talents did their take on the selection cycle in a skit titled “BBE in the Twilight Zone,” which was written by vendor Randall Crosby. Following the Biennial Seminar, vendors travelled back to their homes throughout the state with a feeling of accomplishment and a renewed connection with their fellow vendors. The first two weeks of October are Disability History and Awareness Weeks. It is a time to promote providing instruction for students in all public schools to expand student knowledge, understanding and awareness of individuals with disabilities, disability history and the disability rights movement. Signed into law in 2008, Section 1003.4205, Florida Statutes, entitled 'Disability History and Awareness Instruction', requires school districts to designate the first two weeks of October as Disability History and Awareness Weeks. The Florida Department of Education hosted its Opening Ceremony Wednesday, October 4 in the Turlington Building lobby. Speakers included Division of Public Schools Chancellor Hershel Lyons, Division of Blind Services Director Robert L. Doyle III, Division of Vocational Rehabilitation (VR) Director Allison Flanagan and former VR Director Aleisa McKinlay. There was also be a special performance by the Electric People band. 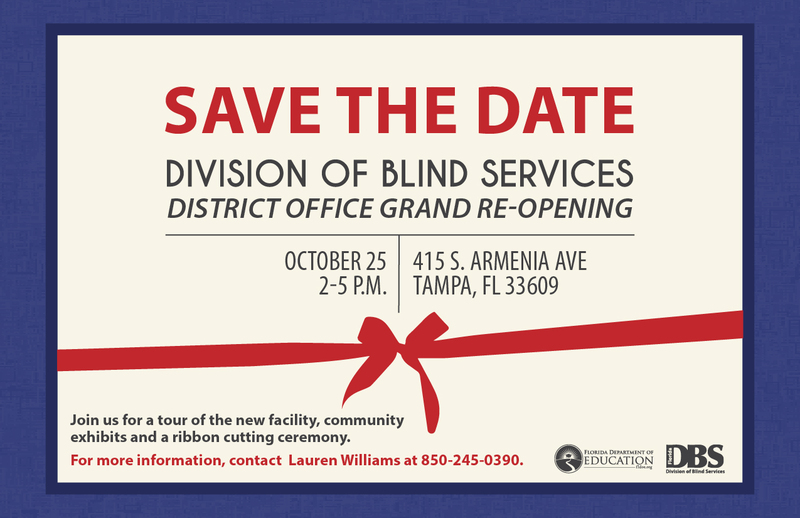 The Division of Blind Services will host a grand re-opening and open house and for its Tampa office, Wednesday, October 25 from 2:00 to 5:00 p.m. Located at 415 S. Armenia Ave. in Tampa, the day will kick off with a brief program and ribbon cutting ceremony. Guests will also have the opportunity to meet-and-greet with DBS staff, partner organizations, and tour the new facility. For more information, contact Lauren Williams at 850-245-0390. Congratulations to the Department of Education Café 325’s newest operator, Jason Carpenter. Carpenter, who took over this role on September 29, is a vendor with the Division of Blind Services (DBS) Bureau of Business Enterprise (BBE) Program. Current blind vendor Mike Renaud served as the operator since Café 325’s inception earlier this year. 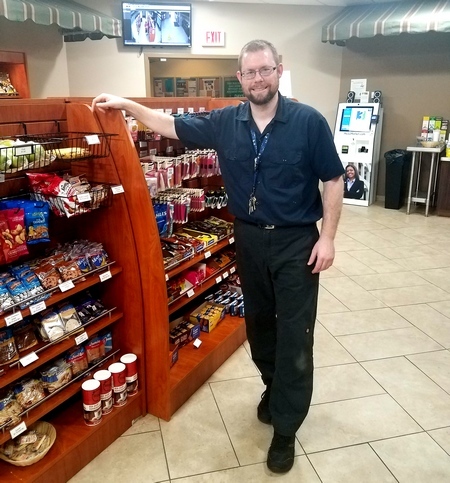 Renaud will continue to be the manager of both Madison County rest area vending stands. Carpenter became involved with the BBE Program in 2013. 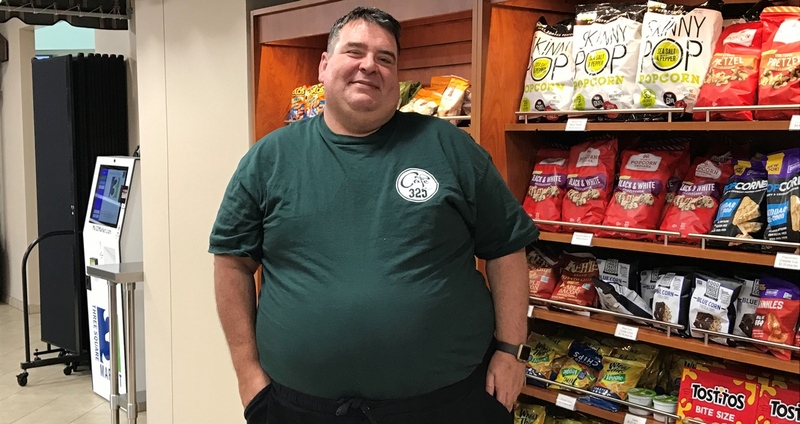 After becoming licensed, he applied for and was awarded a snack bar with vending at the state-leased Fort Knox complex in Tallahassee and took over the complete operation of the vending and the snack bar in March of 2015. Café 325 was listed on the BBE May Business Opportunity listing and he applied for it. Carpenter’s recent success earned him the offer of Café 325. Located on the first floor of the Turlington Building, Café 325 features self-checkout kiosks and offers sandwiches, salads, snacks, drinks and more. The Tampa Lighthouse for the Blind hosted its Lighthouse Fall Cookout and White Cane Day Fest, Friday, October 13. There was music, food and a community walk. DBS Director Robert Doyle served as a guest speaker. White Cane Day is a time to celebrate the abilities and successes achieved by persons who are blind. The day is also intended to educate the public about the White Cane Law, which requires motorists to stop when a pedestrian carrying a white cane or accompanied by a guide dog is crossing a street. As the weather gets colder and days grow shorter, it can be even more tempting to turn to food for entertainment or comfort. Once the holiday season begins, there are many opportunities for overindulging. The following tips can help you to navigate potential pitfalls and feel your best. Distinguish physical hunger from emotional hunger. Is your stomach growling? Or do you want to eat because you're surrounded by food? Or are you anxious, lonely, bored or upset? Tune in and notice what's going on. Then decide whether you need to eat or if there's something other than food that would be more helpful. Plan ahead. If you know there won't be anything you'll feel good about eating at that holiday party, have a substantial snack before you go or bring something that you would feel comfortable eating. Practice good self-care. It's easy to get off schedule with sleeping, exercising and taking time for ourselves during the holidays. But all of these things will help us to feel more grounded and make healthier choices. Never leave home without a healthy snack. Snacks like nuts, seeds, dried fruit, kale chips and roasted edamame travel well. Keeping some in your car, bag and desk drawer will make it much easier to opt for a healthy choice. Hydrate. Thirst can actually mask itself as hunger. During the colder months, we often forget to drink as we should. Add some fruit to your water if you want to "perk it up." Make sure you're drinking plenty of water and try to avoid sugary beverages as well as too many alcoholic or caffeinated drinks. A blind football player at the University of Southern California helped lead his team to victory last month, and now he’s opening up about his remarkable story. 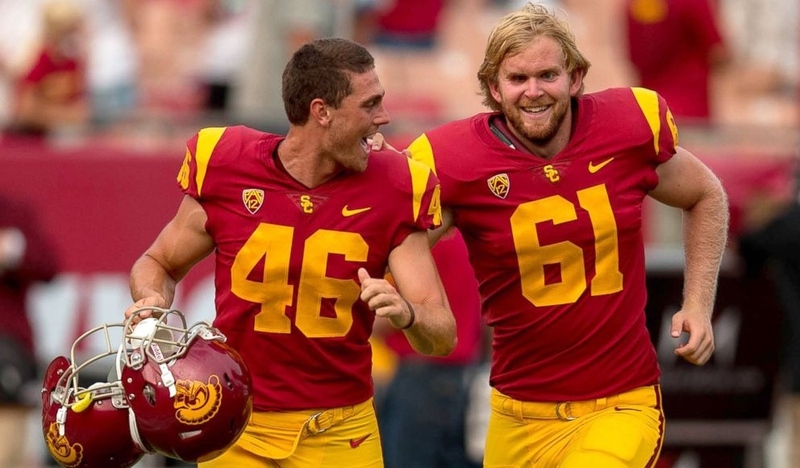 Jake Olson, 20, the team's long snapper, made his debut as a Trojan in a game against Western Michigan University. Late in the fourth quarter, Olson snapped for an extra point. The Trojans won the game 49-31. "It was emotional," Olson said. "Just the pure bliss and just knowing that I accomplished a goal, I was able to give the Trojan nation and really the entire sports world a message of inspiration and hope." 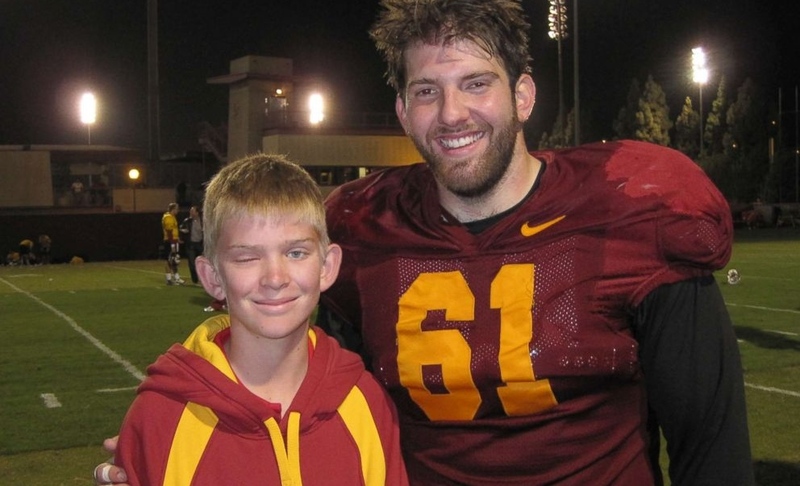 Olson, now a junior at USC, was diagnosed with retinoblastoma when he was one year old and lost one of his eyes. The cancer came back eight times. In 2009, at the age of 12, doctors told Olson he would lose his other eye. For hours, Hurricane Irma's winds battered Jorge Hernandez's house in Flagami. Days earlier, he had mounted accordion shutters as a precaution, but now the metal clanged violently against his windows. Petrified, his fiancée and her 18-year-old daughter scrambled through the pitch-black darkness, but even as they got upstairs, they realized there was no escape. The sound reverberated on every floor. "I was OK, though," Hernandez says. "I can manage around our house without lights, no problem." 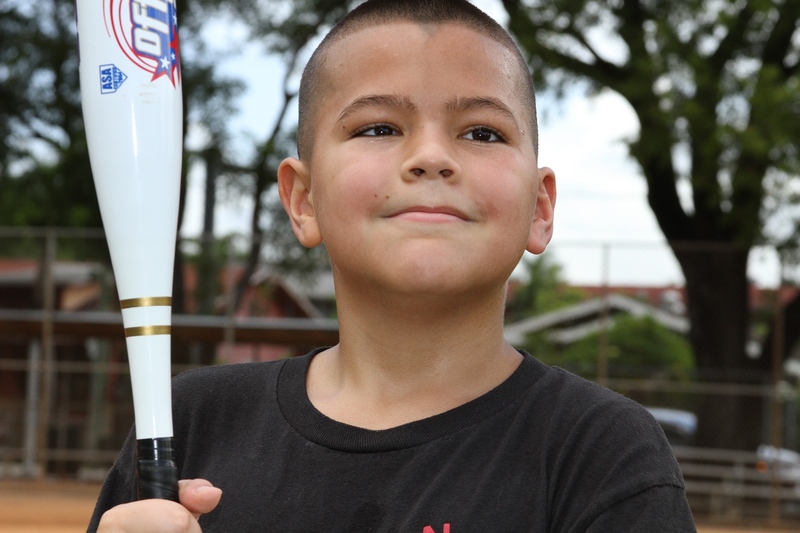 When Hernandez was nine years old, doctors diagnosed him with retinitis pigmentosa, a rare condition in which the back of the eye is permanently damaged. 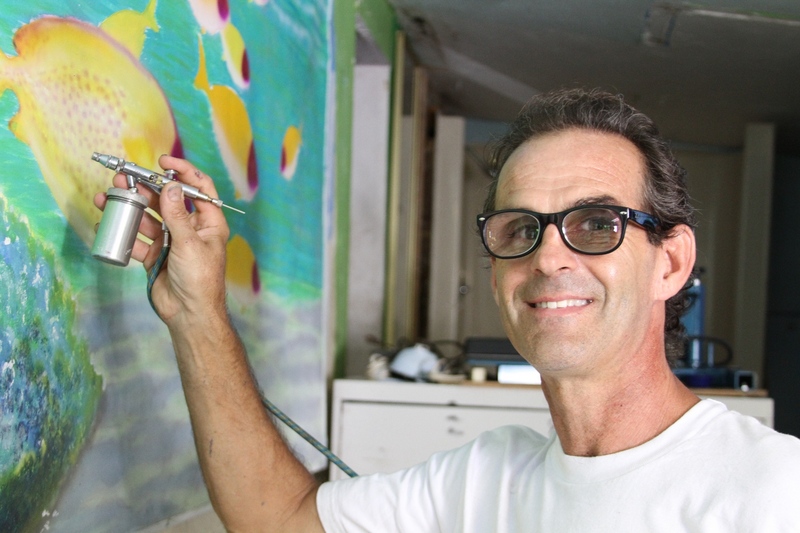 Since then, the 51-year-old technology instructor from Cuba has learned to live without eyesight. Days before the storm hit, Miami-Dade County offered beds in special-needs shelters, emergency transportation services and nonperishable food to its citizens with disabilities. Even so, the majority of the county’s estimated 67,000 blind or visually impaired residents opted to ride out the storm at home, either alone or with loved ones. Blindness can be an especially difficult disability during a catastrophic storm, so many prepared days in advance, stocking up on supplies and reaching out to their communities for help. Though streets flooded and power was lost, Miami’s blind say they fared reasonably well during the storm, avoiding injury and weathering Irma’s wrath. Not many people yearn to kayak across the Bosphorus strait in Turkey. 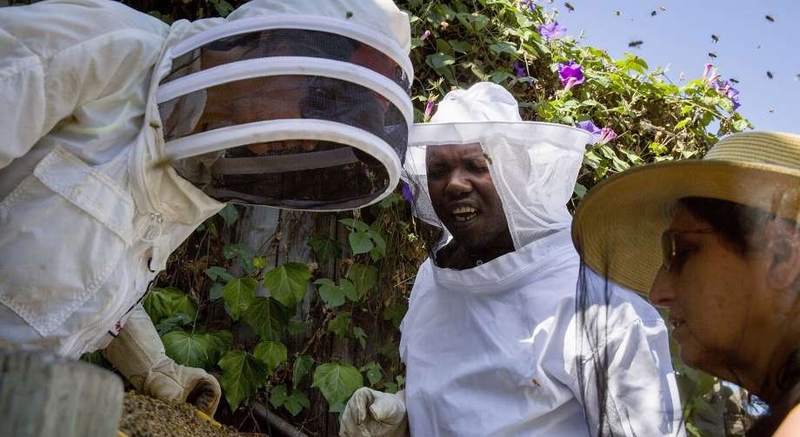 Relatively few have the inclination to keep bees. And a good number would panic if required to construct a perfect peach galette. Now imagine doing these things without sight. 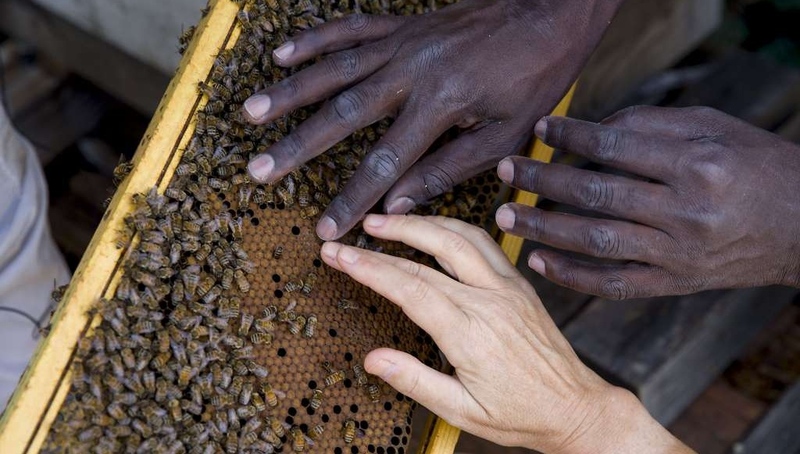 Blindness hasn’t deterred Bay Area kayaker Ahmet Ustunel, Ugandan beekeeper Ojok Simon and British chef Penny Melville-Brown, the inaugural winners of the Holman Prize, awarded by San Francisco’s nonprofit Lighthouse for the Blind and Visually Impaired. They each received $25,000 to pursue their passions, a project meant to inspire and educate people around the world about the boundless abilities of the blind. Newly honored, the three gathered in San Francisco to demonstrate their skills and launch their efforts. To read the full story, visit http://www.sfchronicle.com/bayarea/article/SF-group-s-awards-allow-blind-baker-beekeeper-12224147.php. Daytona DBS Administrator Phyllis Heath has made a successful journey helping others with visual impairments. After the Orlando native received her master’s degree in rehabilitation counseling from the University of Kentucky, she soon moved to Tennessee and became a training center manager for the Tennessee Vocational Training Center in Manchester. 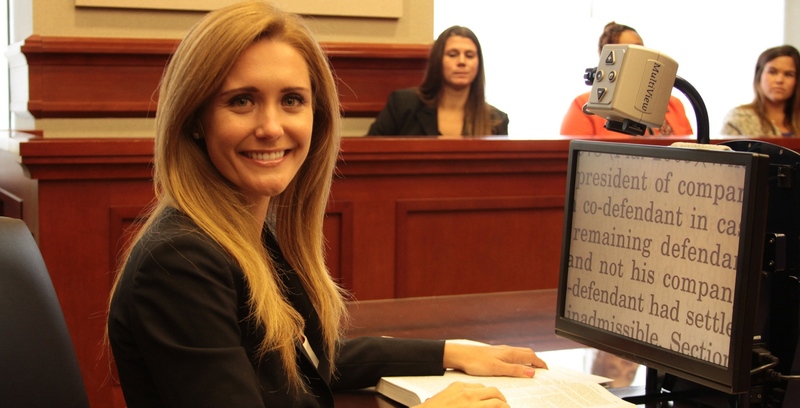 Fifteen years later, she began working for the state of Florida. Some of her primary goals for the district include building stronger relationships with partnering agencies in her area and assisting individuals to reach their fullest potential. “I am in a field that truly makes a difference,” she said.